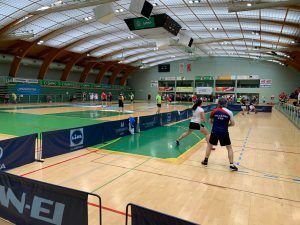 Over 170 participants from 16 countries played at the first ICO Masters Series crossminton tournament of the 2019 season that took place in a famous Slovenian basketball hall Tri lilije in Laško. In female category, 18-year old Slovenian rising star Lori Škerl continued to show good form from the last season by beating Anna Hubert from Germany in an exciting three set final (4:16, 16:14, 16:11). World No. 1 Marta Urbanik from Poland and Danaja Knez from Slovenia finished in joint third place. Open category final featured an exciting match between World No. 1 Petr Makrlik from Czech Republic and the hard-smashing vice-World Champion Marcin Ociepa from Poland. Excellent serving and great all-round attacking play brought joy to the Czech team with the final score of 16:9 and 16:10 for Makrlik. Daniel Knofliček (CZE) and Misha Mandryk (UKR) both finished third. Petr Makrlik also won the open doubles together with Melker Ekberg, while mix doubles were won by Danaja Knez and Adrian Lutz. In other categories, Morten Pasche (NOR) won O-40 men category, while Jacek Czeremuzynski (POL) and Marketa Wernerova (CZE) won the titles in O-50 men and O-40 women categories. In junior categories, Janka Gergö (HUN) won U-12 girls category, Jan Ščavnicky jr. (SVK) U-12 boys, Zuzana Holesinska (CZE) U-14 girls, Matej Krupička (CZE) U-14 boys, Gala Zukić (CRO) U-18 girls, Maciej Filipowicz (POL) U-18 boys, Maciej Filipowicz /Szymon Michniewicz (POL) U-18 doubles boys and Gala Zukić/Nika Miškulin (CRO) U-18 doubles girls.